Salman Khan has been on a spree of promoting his upcoming film, Dabangg 3 already! The film went on the floors recently and the makers are kind of marketing it by posting various stills and videos from the film's set. Yet again, the superstar Khan posted a new pic from the set as he wrapped up the Maheshwar schedule. He can be seen in his signature Chulbul Pandey look here. The snap seems to be one of the stills from the title track of the song. Just a week ago, a video clip got leaked from the set when the cast was dancing on the title song. Do we need to mention, how dashing the actor looked in that blue shirt and blue denims combination? Below is the proof! 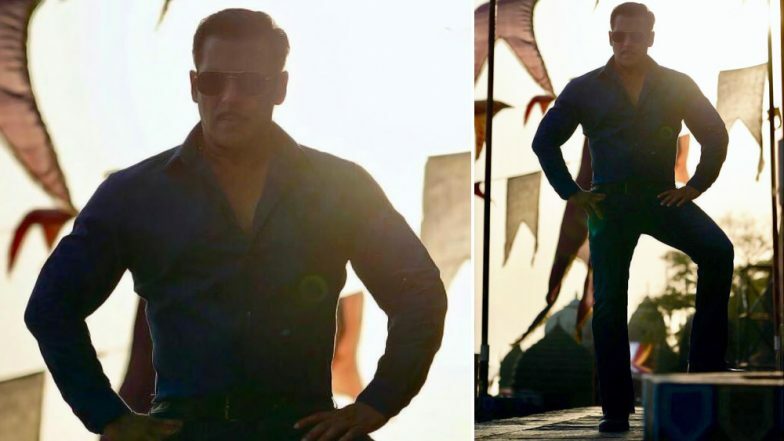 In case, you are not updated with what is happening in the Dabangg 3 world, the BTS pics are already. Catch up with all the Dabangg 3 goss in pictorial form here and thank us later! Here are all the posts that are out until now. On the other hand, Sonakshi Sinha too revealed her look as 'Rajjo'. She is reprising her role for the third time after two successful installments. The flick will be directed by choreographer-actor-filmmaker, Prabhudheva.